The best way to share your love for the outdoors with the little ones in your life is to get outside with them and let them experience the beauty and magic of mother nature with their own two eyes. Walking hand in hand with a little one is slightly difficult, especially when walking is not even an option. Lucky for us, walking is not their only option! Just like their larger counterparts, children love to explore their worlds. Whether it’s the great outdoors, theme parks, or a brisk walk through the park. 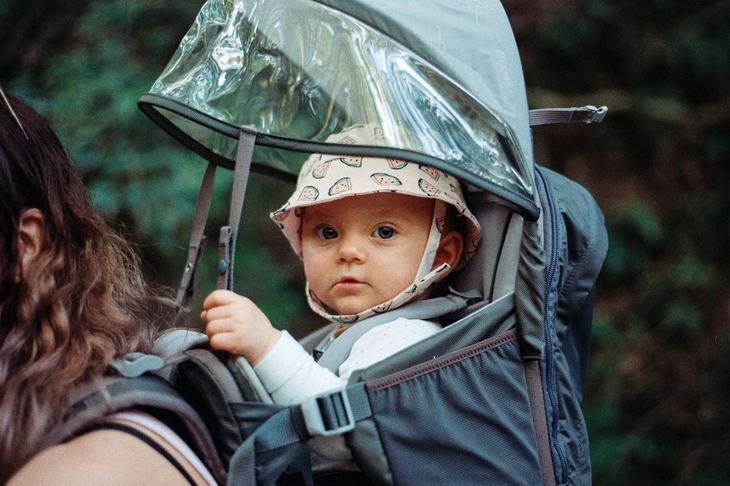 A stroller can work for certain concrete outings with Mom and Dad, however, when it comes to hiking and backpacking strollers become more of a burden. Children can get fussy from a rocky ride, killing the zen-like vibe of an adventure. Instead of compromising a parent’s need for exercise and exploration, baby backpacks are here to save the day. How many miles are you hiking? What kind of frame should I buy? Is there rain and sun protection? 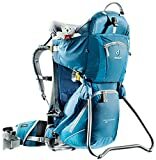 Is the pack adjustable for child growth? 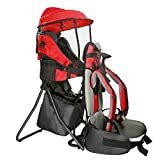 Is the baby hiking backpack well ventilated? A child’s early years are filled with rapid development (source). The more a child explores their world, the more curiosity and security a child develops. In the first few years of life, children soak up a huge amount of information. Experiences are the most effective way for young children to process new information (source). The more a child can safely explore new terrain, the more comfortable a child will be to explore when they are older. The more active a child is, the more a child needs to sleep. On top of this logic, the physically closer a child is to their parent, the less stress a child endures. Touch is a magical thing as it lowers stress levels in a young child (source) and provides other benefits such as better weight gain and neural development, and less crying. Without having to worry about finding a sitter, parents have much more freedom to continue doing what they love. With their child on their back, parents have their hands free for whatever they want to do on their adventure. After nine months of pregnancy, mothers need help shedding the extra weight they have accumulated. Carrying a baby on their backs makes their hike more strenuous, making shedding a few extra pounds much more enjoyable. There are a number of factors that go into finding the right baby hiking backpack for you. Children can get fussy quickly, so taking a little time to ensure that every box is checked is going to make all parties involved happy and comfortable. It is recommended that your baby is able to fully hold its head and neck to safely ride in a backpack (around 6 months old). If your baby is too young to hold its head and neck, it is better to carry the baby on your chest with a sling so the child can use your chest for head and neck support. Some baby hiking backpacks are adjustable to the child’s height and can be adjusted to the child as they grow, however, the heavier your child is the more you should seek to distribute the weight on your body. The best designs are those that put more weight on your hips than your shoulders, putting less stress on the parent’s back. 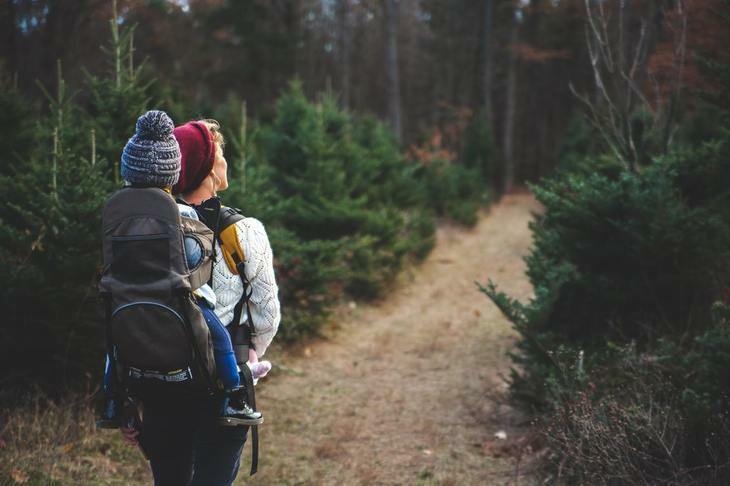 For the serious hiker covering lots of miles, having the ability to comfortably carry your child will make the difference between a long and enjoyable trip rather than a short and miserable one. Finding a pack that will rest comfortably on your back for hours without too much stress on your lower back and hips is crucial. Turning around is always an option but will leave a bad taste in your mouth. If possible, it is a great idea to try on the backpack you are planning to buy. The backpack should not be too large or too small for you. If there is a hip or chest strap, make sure the strap is not too far above or below the hips or chest. Some frames are made with aluminum to maintain a supportive yet light frame. These are better for longer hikes. If a parent is concerned for their child developing hip dysplasia (the misalignment of a baby’s hips occurring during development), purchase a backpack with a wider seat and stirrups for their feet. Falling out of a backpack may make a child uncomfortable with hiking and can lead to injury. We suggest you find a backpack with a 5-point harness (two straps for the shoulders, two straps for the thighs, and one strap for the crotch). Relying on only a waist strap could enable your child to wiggle out of the backpack. The straps and openings for the baby should have a snug fit, and be tight enough so the child cannot slip out. Side Note: Never bend at the hip with a child loaded in a backpack. This can dump a child over your head and onto the ground. Instead always bend at the knees when carrying a child on your back. Children need to be protected from rain, wind, and sunshine as their skin and eyes are sensitive. Canopies are useful to protect your child from the elements but are not all made equal. Be sure to check that the backpack’s canopy fully covers your child, and provide a hat and sunscreen in case they hang outside of the canopy. Some manufacturers make backpacks that can adjust to your child as they grow. However, always check the weight range of each backpack before purchasing it. All backpacks you purchase should have adjustable straps for both the carrier and the child, but make sure that the child’s straps cannot be easily loosened by the rider. If your little one loosens their straps by themselves, they can risk falling out of the pack. Bringing your little ones on a hike involves more than simply throwing them on your back. You want to ensure that the pack has ample storage for everything the baby might need. All of the backpacks have pockets, some more than others. The primary storage is in the front of the pack and this is designed to hold diapers, towels, and any extra clothing you plan on bringing. There is smaller pockets on the sides of the pack and some even have insulated pockets for bottles. Ventilation is key, especially in the summer months. 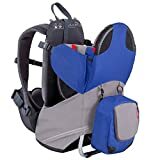 A good baby hiking backpack will have ventilation both along the panel in the back, as well as, around the child’s seat. The best baby hiking backpacks will have mesh panels for increased airflow. These baby hiking backpacks are designed to make your transition to life on the trail with a child seamless. Here are the 7 best baby hiking backpacks of 2018. Osprey is a juggernaut in the hiking world and developed a backpack that is perfect for the outdoor loving parent. A sore back is a big problem when carrying a child on your back and Osprey designed this backpack to mitigate most back pain. There is a lightweight aluminum frame that increases load (your child’s) stability with a mesh back to limit excessive sweating. This is one of the few packs that include a mirror for keeping an eye on your little one. The sunshade sits in a zipped pocket that is easily extended when the sun becomes an issue. The pack is adjustable meaning that it will accommodate the growth of your child so you can plan on using it for multiple seasons. MULTIPLE POCKETS + INSULATED POCKET FOR BOTTLE: We know how much gear goes with you and your baby so we have designed our carrier with multiple pockets specifically for you and your child. There are mesh pockets on the outer surfaces plus a large pocket on the back. The Waist belt has pockets for your phone and keys and there is an insulated pocket for baby's bottle. The LuvdBaby Hiking Backpack is lightweight and remains balanced throughout the hike, even when your child is bouncing around and can’t sit still. It’s comfortable enough for your baby to sleep in, can store all of their supplies, and includes an insulated pocket for milk. Parents with children who struggle to nap fall right asleep in this carrier and the pack are snug enough that your child won’t be able to wriggle out. It comes with a sun and rain shade, stirrups, and adjustable straps for the baby’s chest, hips, and crotch. 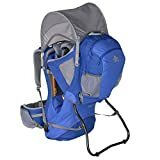 The Kelty Pathfinder 3.0 Kid Carrier is a luxury baby hiking backpack that has all the features of a premium baby hiking backpack (with a premium price). It’s a JPMA certified backpack which means it has been thoroughly tested and approved for use by young children. It comes with a 5 point adjustable harness that easily locks into place and comes with stirrups for your child’s feet. The quick suspension system is speedy and user-friendly so you can easily distribute and quickly find the perfect fit. There is a sun hood to protect your child’s head from the sun, a removable daypack, and hydration bladder ready compartment. It’s full of features that make your hike both safe and comfortable. The Baby Back Pack Cross Country Carrier includes a retractable sun and rain shield, ample storage, food stirrups, and a plethora of padding in the shoulder and hips. This backpack can be adjusted to multiple frames, making it extremely versatile. The pack is comfortable enough for your baby to sit comfortably for several miles. However, it’s difficult to secure your gear in the pack, which may be a problem if your child gets a kick out of throwing things (and who doesn’t). One of the best parts of this baby hiking backpack is the versatility in age groups. It works well from a baby all the way up to 50 pounds comfortably. The Deuter Kid Comfort 2 is a great choice for the serious hiker. This backpack has plenty of storage and is designed to fit hikers of all sizes. It has plenty of ventilation for those hot summer days, as well as a pore structure in the padding that facilitates airflow to your child. The backpack is fully adjustable in nearly every part of the pack, making the switch from mom to dad a breeze. There are handles on both sides that make the pack safe to lift with a child in tow. In addition, it includes extra features such as a stand-alone kickstand, padded belts, and a 5-point safety harness. With a 48-pound carrying capacity, it will work for years depending on how fast your child grows. Phil and Ted’s Lightweight Backpack Carrier is both lightweight and comfortable. It includes enough space for all the important things a young child needs. It also breaks down to lay flat, meaning that taking it on a plane or in a car easy. Children have plenty of room and good visibility in this pack. This is a great pack for beginners due to its ease of use and the stand-alone kickstand, which lets parents set their children down without having to take them out. COMES WITH TRAVEL BAG + HYDRATION PACK + REMOVABLE TODDLER BACKPACK: Our simple travel bag protects and stores the baby carrier while at home or while traveling. When stored in our Travel bag Retro Scout will fit in the overhead compartment of most commercial airliners. The Retro Scout hydration pack stores neatly inside of the backpack and is ergonomically convenient. Retro Scout offers a zip up & removable backpack w/ leather straps that is suitable for a toddler to young child (ages 3 - 10). HOW IT LOOKS AND FEELS MODEL SIZES: As shown model (mom) size 8 with jean size 28. (Retro Scout will fit a waist size 27 - 40). Baby model is 2 years old and 28 lbs. Retro Scout is suitable for babies from 6 months (must be able to hold head up on their own) to 4 years (no more than 40 lbs). HIGHLY ADJUSTABLE - ERGONOMIC BY NATURE: Parent: Adjusts at waist; chest; shoulder straps; torso length adjustment. BABY: seat height; depth; stirrup length; 5 point harness (waist, shoulders). SAFETY: Backpack was safety tested for fall hazard, fire hazard, lead and other baby carrier related safety concerns by a CPSA certified lab. RISK FREE - if you are not absolutely IN LOVE with your Retro Scout backpack, send it back for a full refund including shipping. The Be Mindful-Hiking Child Carrier Backpack offers both comfort and storage. The pack comes with a duffle bag to store the backpack, a changing pad, 3L water storage, an insulated pocket, a sunshade, rain guard, and a kickstand. This pack sits comfortably on the back, is well padded, and had plenty of pockets for all your baby-related gear. The insulated pocket comes in handy when you want to keep a bottle or snacks at the desired temperature.